The Collinsville City Commission met Monday, Oct. 16th at 7pm (at the City Hall Community Room, 106 N 12th Street) for a regular meeting of the City Commission and Municipal Authority. Trustees T rent Rogers, Pam Porter & Stan Sallee were present (Melodie Bateman was absent & the Ward 4 seat vacant). * City Attorney report -- Ken Underwood reported a draft hotel/motel tax document has been prepared and is in review by the city manager. Mayor Sallee indicated if it were approved by the commission by November it could be included for a Feburary election. * Discussion and possible action concerning appointment of Ward IV Trustee to complete term of Brad Overholt. -- James Rigdon was appointed and appoved by Trustee Trent Rogers, Pam Porter and Stan Sallee. 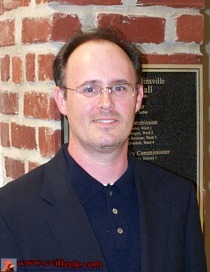 James has been a Collinsville resident since 2001 and looks forward to more involvement in the community. * Discussion and possible action concerning appointment of Ward I Planning Commissioner to complete the term of Leslie Russell (who had resigned) -- action deferred to next meeting. * Discussion and possible action on request from Shelter Free Will Baptist Church to close North 12th Street between Oak and Walnut from 5pm until 8pm for a Youth Gathering on Oct. 21, 2006. -- Approved -- A Christian Concert will be held with 10-15 churches and the neighbors invited.